A city news website successfully challenged an order barring journalists from revealing details of a far-right activist’s imprisonment for contempt of court. Leeds Live challenged an order made at Leeds Crown Court barring any mention of court proceedings involving Stephen Yaxley-Lennon, better know as Tommy Robinson, the former leader of the English Defence League. 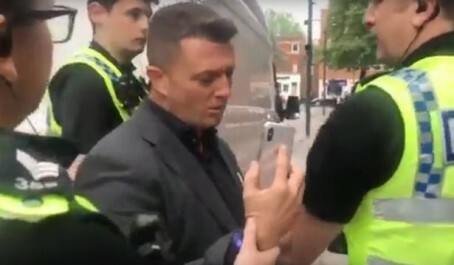 On Friday morning, Yaxley-Lennon was arrested outside the court, where he was conducting a Facebook Live video viewed hundreds of thousands of times, on suspicion of a breach of the peace. A court order is currently in place temporarily banning any reporting on a trial being heard at Leeds. The 35-year-old was arrested and held in the court cells before being taken up to the courtroom to face said trial’s judge, who sentenced him to 13 months in prison that day for contempt of court. Yaxley-Lennon was sentenced to three months imprisonment suspended for 18 months last May, after he was found in contempt of court over a case in Canterbury, and had been warned that committing further offences would result in incarceration. A reporting restriction was applied to Yaxley-Lennon’s arrest, charge and hearing on Friday, but was successfully challenged today by Stephanie Finnegan, court reporter for Leeds Live and its Trinity Mirror sister newspaper the Huddersfield Daily Examiner. A piece on the Leeds Live site states: “[Yaxley-Lennon] came to Leeds on Friday morning – and it was his Facebook Live which led to his imprisonment that afternoon. But this was not simply a case about freedom of speech, despite what his supporters have said on social media. “His arrest and conviction were to protect our justice system – and ensure a trial that cost hundreds of thousands of pounds didn’t collapse. Explaining why his sentence hadn’t been reported before today, the piece added: “A reporting restriction was applied to Stephen Yaxley-Lennon’s arrest, charge and hearing on Friday. Although Leeds Live were aware of the proceedings and our court reporter was present for his sentencing, we did not report the story on Friday. “The restriction didn’t mean the case could not be reported at all – it just postponed reporting of the proceedings until there was no risk of his case prejudicing another trial. As a retired reporter who began working in 1965 I am fed up with courts/judges increasingly resorting to imposing blanket bans on reporting matters of public interest. As far as I am concerned there were no security/national interests at stake here. Where does it stop and end. Of course, there may be more attempts at such impositions because there are fewer journalists on papers and esp those reporting courts. That blanket ban was very ill-judged. Because of it, the extremely ignorant had a field day on social media, while the truth could not be properly reported. Well done, Leeds Live!